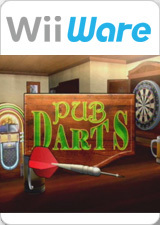 Pub Darts is a simple darts simulation which uses the Wii Remote controller's unique controls to mimic dart throwing motion. The game is set in a local pub where the players will settle in to play some of their favorite dart games including 501, Cricket, Around the Clock, Killers, and Baseball. Controls function just like throwing a real dart. Players are able to create their own personal profiles, including selecting their avatar image from a collection of creative characters and the design they would like displayed on the dart flights. The graph below charts the compatibility with Pub Darts since Dolphin's 2.0 release, listing revisions only where a compatibility change occurred. This page was last edited on 15 January 2018, at 02:43.